Pearl Harbor Attack, 7 December 1941 (Showa 16). 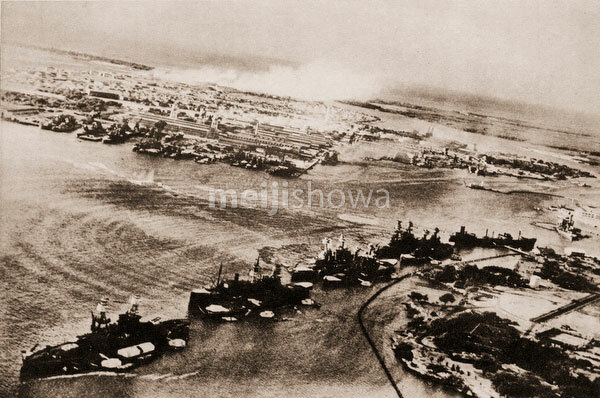 Torpedo planes attack “Battleship Row” at about 0800 on 7 December, seen from a Japanese aircraft. Ships are, from lower left to right: Nevada; Arizona with Vestal outboard; Tennessee with West Virginia outboard; Maryland with Oklahoma outboard; Neosho and California. West Virginia, Oklahoma and California have been torpedoed, as marked by ripples and spreading oil, and the first two are listing to port. Torpedo drop splashes and running tracks are visible at left and center. White smoke in the distance is from Hickam Field. Grey smoke in the center middle distance is from the torpedoed USS Helena, at the Navy Yard’s 1010 dock. Published by the Tokyo Nichi Nichi Shimbun (東京日日新聞).